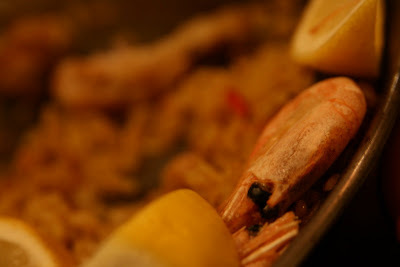 Anna and Jose gave a slightly rough review of my last attempt to make Paella. The main problems they highlighted were that I'd used chicken drumsticks rather than wings, the prawns were not in their shells, nor the mussels, that the rice wasn't yellow enough and I had no lemon as garnish. I think the lack of yellowness might just have been my camera performing badly with the colour with the poor lighting, but even so, I got the saffron as ordered, and made Paella 2.0 using that instead of turmeric. I'm cat-sitting Nutmeg for my parents over the next couple of weeks, and they have pretty decent (although filthy) barbecue with adjustable grill height, so I decided to try and make it on that. I'd brought my Paella with me, knowing that my sister would be a willing taster, that cooking facilities and that better local shops would help with the endeavor. There was also the added bonus of getting my sister to do all the food photography with her decent camera. Although, saying that, she did manage to drain her battery taking pictures of Nutmeg, then have to bolt back home for the spare so that she could take pictures of the finished food. The recipe was pretty much the same as before, except that I used Dwarf Beans instead of Fine Beans, a good pinch of crushed saffron instead of turmeric, and chicken wings, instead of legs (as per Anna and Joses' instructions), plus prawns and mussels in their shells. Also, I used about 50% more rice this time as I was fairly certain it wasn't enough last time. The method was exactly as before, only done on a barbecue instead of the stove. 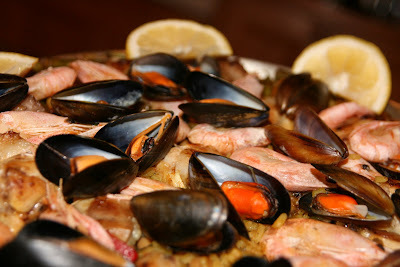 The Mussels were cooked briefly in White Wine before adding to the top of the Paella in the last few minutes of cooking. The other difference is that I didn't use any stock as I seemed to end up with a better stock in the pan this time around, so just added the Saffron and Paprika to the boiling water (3 times that of the rice). I also remembered to add the Chickpeas as I had them washed and drained and out with the rest of my ingredients before I started to make sure nothing was forgotten. My sister's hectic schedule for the day meant that I didn't get started on cooking until there was no real sunlight left in the garden and it was getting dark by the time I'd finished cooking. This was partly caused by the barbecue dying halfway through (luckily at a good moment to pause in the cooking) and us having to get it started again before getting the rice in. So, rather than a nice afternoon meal in the sunshine, it ended up as an evening meal around the dining table. Although I pretty much followed their instructions to the letter this time, I can still almost hear the comments Jose and Anna are going to make. For one, I'm sure they are going to say that I put too many prawns and mussels on the top so that the chicken and peppers are nearly invisible. The rice was cooked to perfection though, with that slightly caramelised bottom, but without sticking to the pan. Definitely got a lot more confidence after cooking this one. I just need to get the time of day right.